Donal bought his first rabbit last summer: a female called June. He heard that rabbits are social animals which are meant to be kept in pairs or small groups, so in the autumn, he bought a male rabbit, named Nova. Each rabbit has a separate hutch of their own, but he lets them out to free-range in the garden together. The two rabbits didn’t get on well at first: Nova seemed nervous about June. But as time passed, nature followed a predictable course, and shortly after the New Year, June had her first litter of baby rabbits. Three kittens (that’s what baby rabbits are called) were born. It’s common for up to a half of a litter to die, so Donal was delighted when all three of the new arrivals survived, suckling their mother and growing rapidly. Donal houses the three young rabbits with their mother, in her hutch. 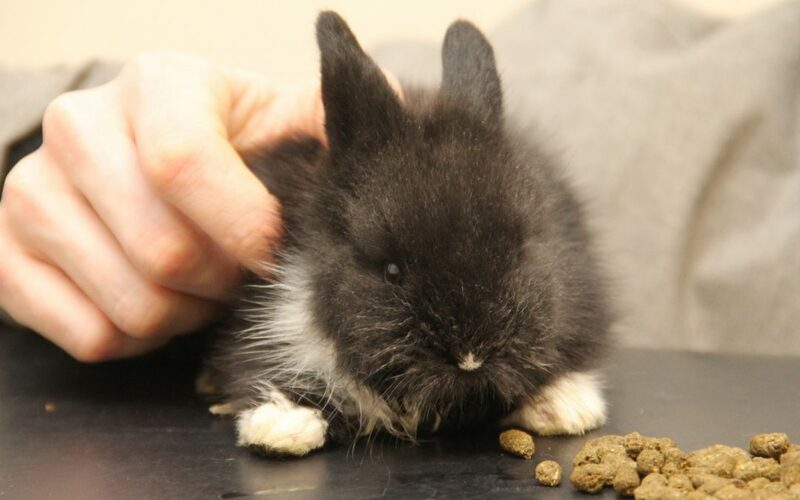 He has not been feeding them separately: young rabbits usually start to eat small amounts of their mother’s food, gradually transitioning from an all-milk diet to the normal adult diet of a rabbit. Donal was pleased to see them all tucking in to the muesli-type diet that he feeds to his adult rabbits. When one of the kits, Socks, became dull and stopped eating enthusiastically, he brought her to see me. She was still very small, weighing less than 200 grams, and it does not take long for a little animal like this to become dangerously ill from dehydration and lack of nutrition. I could not find anything serious wrong with her, so I gave her a general treatment, with antibiotic cover in case she had picked up an infection. I also gave Donal some special “critical care” high-concentration food to feed her. This is a powder which is reconstituted with water, and then fed with a syringe. When I checked her 24 hours later, Socks was much brighter, and she had begun to eat again. At this stage, I discussed the diet that Donal gives to the adults, and that the kits were now beginning to eat. He uses the standard pet shop “muesli” type of rabbit mix, but he had noticed that the rabbits don’t eat it all: they only eat their favourite flakes and seeds. This is known to be a problem with this type of rabbit food: although the food is a “complete” diet if it is all eaten, rabbits are selective eaters. They only eat the tastiest bits, so they can end up having an unbalanced diet which can then cause long term health problems. The optimal way of feeding pet rabbits – adults and young – is to use a complete dry green pellet: the best known brand is Burgess Excel. These pellets contain everything a rabbit needs, and rabbits enjoy the taste, so they happily eat them. Donal also feeds his rabbits fresh cabbage and carrots: I explained that it would be better to get some fresh hay, which is closer to the type of nutrition that rabbits eat in the wild. In the summer time, the rabbits will enjoy grazing on the grass of his lawn, but in the winter, good-quality hay, bought from a pet shop, is essential, to give them plenty of fibre. Socks is making a steady recovery, but young rabbits are sensitive creatures, and there’s still a risk that she might not pull through. Donal is keeping her indoors, in a comfortable warm room, until she’s better. Donal already has homes lined up for the three young rabbits: he has friends who are keen to take them. He thinks that he’ll let Nova and June have another litter in due course. Next time, they’ll be fed green pellets and fresh hay from the start.